That all sounds splendid, but in the meantime your cellphone is ringing, and you’re trying to get the kids to school, all while making a mad dash to work. According to market research firm NPD Group Inc. (as reported in The Wall Street Journal), most people have about 12 minutes in the morning to eat breakfast, and grab-and-go fare or a quick bowl of #cereal are the most popular choices. Even though cereal consumption is falling due to increased awareness of carb weight gain and increased competition from fast-food outlets, cereal bars and yogurts, it’s still a very popular breakfast food. And, often times, it is the only quick option. That said, when you go to the supermarket, the number of cereals to choose from can be overwhelming, especially when you’re trying to figure out which is the healthiest. Does it have whole wheat? Does it have too much sugar? What about the sodium? What about the fiber? These are just some of the many questions you might have about the cereals you eat for breakfast every morning. Cereal is still in more than 90 percent of U.S. households, with more than 2 billion boxes sold during a 52-week period ending in August 2011. And according to market research company Mintel, 93 percent of respondents stated that they consume ready-to-eat cereals. DietDetective.com evaluated 301cereals, giving them health scores and ranking them in order of healthiest to unhealthiest. To come up with the health score, we looked at 19 health criteria, including: calorie count per gram and per serving; sugar per serving and per gram; carbohydrates, protein and sodium per serving; added sugar; ingredient placement of sugar; fiber content (excluding added fiber when discernable); ingredient placement of whole grains; number of ingredients; presence of real food (dried fruit, raisins, nuts); vitamin fortification (Note: Fortification leads to a reduced health score because we believe whole foods should provide nutrients, and adding vitamins and minerals leads to public confusion regarding the nutritional profile of that food. ); presence of food additives on the Center for Science in the Public Interest’s (CSPI) Chemical Cuisine “Avoid” list (e.g., artificial colorings, caramel coloring, BHA, trans fat); presence of food additives on the CSPI’s Chemical Cuisine “Caution” list; claims based on added ingredients; and whether there are cartoon characters on the box (presence is judged as a negative). These are the highest-ranked cereals based on the DietDetective.com’s 19 criteria. These are the lowest-ranked cereals based on the DietDetective.com’s health score using 19 criteria. This is one of the better ways of comparing cereals, particularly because the serving size and density differ from one to another. The cereal with the fewest calories per gram is listed first. All the cereals on the list have fewer calories per gram than 291 others. This is one of the better ways of comparing cereals, particularly because the serving size and density differ from one to another. The cereal with the most calories per gram is listed first. All the cereals listed here have more calories per gram than 290 other cereals. The following cereals contain NO sugar. This is one of the better ways of comparing cereals because it eliminates variations in serving size. The cereal with the most grams of sugar per gram is listed first. The cereals listed below have more sugar per gram than 289 other cereals we investigated. According to their labels, the following cereals contain NO sodium. This is one of the better ways of comparing cereals because it eliminates variations in serving size. The cereal with the most sodium per gram is listed first. The cereals on this list have more sodium per gram than 291 other cereals. — Stick with Low Calories: Choose cereals that are low in calories per gram. To find this number, divide the number of calories in a serving by the number of grams per serving listed on the nutritional label. — Watch the Sodium: Many cereals are high in sodium; the Institute of Medicine recommends no more than 1,500 mg of sodium per day. — Avoid Added Sugar: According to the Centers for Disease Control and Prevention (CDC), the term “added sugar” is defined as any “sweeteners added to processed and prepared foods.” While many sugars are found naturally in foods such as milk, fruit, vegetables and grains, it’s the sugars added to many of the foods we eat (by food companies) that we have to watch out for. Remember, regardless of the name, whether it’s honey (although there is some research that indicates honey can help with allergies and work as an antibiotic), brown sugar, raw sugar or maple syrup, all added sugar essentially adds calories without significant nutritional value. Molasses may be the one exception, because it is actually a fair source of potassium, calcium and iron. When you read a food label, look out for: corn syrup, cane sugar, brown sugar, brown sugar syrup, dextrin, dextrose, dried cane syrup, glucose, fructose, high-fructose corn syrup, honey, invert sugar, lactose, maltodextrin, maltose, mannitol, molasses, natural sweeteners, polydextrose, raw sugar, sucrose syrup, turbinado sugar, xylitol, organic evaporated cane juice, evaporated cane juice, evaporated cane juice crystals, evaporated cane sugar and maple syrup. —Not For the Carb-Minded: Researchers have demonstrated that a “low-carbohydrate diet was more effective for weight loss and cardiovascular risk-factor reduction than the low-fat diet.” The participants in this particular study ate fewer than 40g of carbs per day. The average cereal has more than 30g. — Don’t be Fooled by Health Claims on the Package: Yes, cereals are nutritionally dense and can be very filling—especially the ones made from whole grains. However, just because they have extra vitamins and minerals doesn’t mean you can eat as much as you want. Even if a cereal boasts “High Fiber,” “Excellent Source of Calcium” or “Organic,” it may still contain a significant amount of sugar, sodium, calories and even fat. —Serving Size Matters: Typically, we eat anywhere from 1 to 3 cups of cereal at one sitting— not necessarily the serving size listed on the food label. Because of this, you need to closely monitor how much you’re eating so you don’t go overboard. 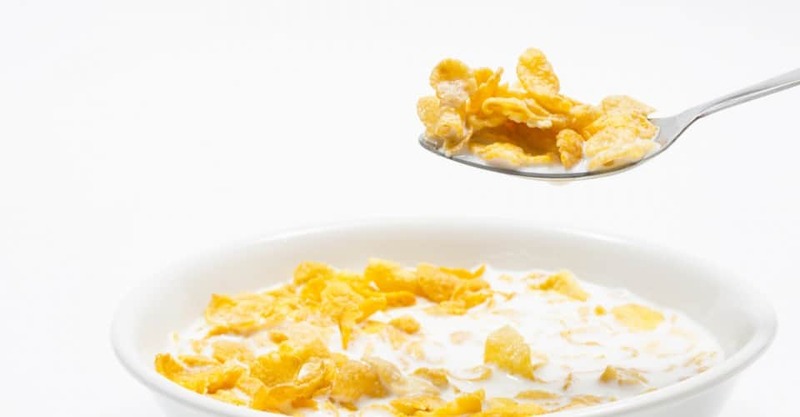 If you want to compare cereals nutritionally, keep in mind that they have different densities (e.g., flakes, nuggets, puffs), and, as a result, it’s more difficult to compare one with another. Some, such as Shredded Wheat or Grape Nuts, are quite dense, so, based on the food label, they look like they’re very high in calories. Therefore, based simply on volume (number of cups) it’s tough to compare their nutritional values to less dense cereals like Rice Krispies or Cheerios. In theory, the more dense the cereal (the more grams per serving), the less you are likely to eat. So, when you’re trying to pick the best cereal, check the weights listed next to the serving size (grams) and compare the calories per gram by dividing the calories by the number of grams per serving. — Skim It: Choose skim milk to go with your cereal. You get essentially the same nutrients from skim milk as you do from drinking whole milk—minus the fat, of course—so stick with the low-calorie version and save about 64 calories and 8 grams of fat per cup. The carb contents are similar: Skim is slightly higher, but by less than half a gram. — Added Fiber: Many cereals have added fiber; check the label for chicory root/inulin, maltodextrin, polydextrose, soy hulls, wheat fiber, oat fibers and sorghum fibers. Many researchers believe that added fiber doesn’t have the same health benefits as the fiber that occurs naturally in whole foods. Bottom line: Don’t just look at the amount of fiber on the food label; you also need to check the ingredients list. — The Fewer Ingredients the Better: Choose the cereals (and all your foods) that have the fewest ingredients, and make sure they’re names you can pronounce. — Avoided Added Protein: Cereal companies are trying their best to overcome the low-carb craze and capitalize on the idea that protein keeps you full, by adding protein to cereal. Don’t be fooled: It’s not the same as eating eggs or egg whites and other low-calorie protein sources. However, cereals with nuts are a great source of protein. — Whole Grains are Important: Look for whole grains as the first ingredient on the food label. These could include brown rice, buckwheat, bulgur, graham flour, oatmeal, quinoa, rolled oats, whole-grain barley, whole-grain corn, whole oats, whole rye, whole wheat and wild rice. — Avoid “Fortified with Vitamins”: Research is demonstrating that adding vitamins to cereals is not the same as getting them from whole foods. 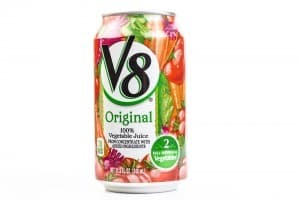 Looking for vitamin C? Eat an apple.